Manchester United take on Tottenham Hotspur at Wembley this evening. 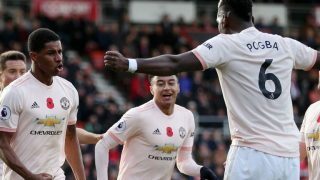 Caretaker manager Ole Gunnar Solskjaer as named his line-up to face third place Spurs. A win for United would see us draw level with Arsenal on points in fifth place, though we’ll need to bolster our goal difference to overtake them in the Premier League standings. The shackles are off United now and, like Spurs, the Reds are a great team to watch so we should be in for a highly entertaining game. The team confirmed by United’s official Twitter account, as seen below, is exactly how we predicted it here. It’s great to see Paul Pogba back fit as United are always better with him in the team than without. The front three will be tasked with breaking down an impressive Spurs defence — consisting of Jesse Lingard, Anthony Martial and Marcus Rashford. United need three points to gain ground on their opponents, though we’d happily take a point away from home.